The Earth is often compared to a majestic blue marble, especially by those privileged few who have gazed upon it from orbit. This is due to the prevalence of water on the planet’s surface. While water itself is not blue, water gives off blue light upon reflection. For those of us confined to living on the surface, the fact that our world is mostly covered in water is a well known fact. But how much of our planet is made up of water, exactly? Like most facts pertaining to our world, the answer is a little more complicated than you might think, and takes into account a number of different qualifications. In simplest terms, water makes up about 71% of the Earth’s surface, while the other 29% consists of continents and islands. To break the numbers down, 96.5% of all the Earth’s water is contained within the oceans as salt water, while the remaining 3.5% is freshwater lakes and frozen water locked up in glaciers and the polar ice caps. Of that fresh water, almost all of it takes the form of ice: 69% of it, to be exact. If you could melt all that ice, and the Earth’s surface was perfectly smooth, the sea levels would rise to an altitude of 2.7 km. Aside from the water that exists in ice form, there is also the staggering amount of water that exists beneath the Earth’s surface. 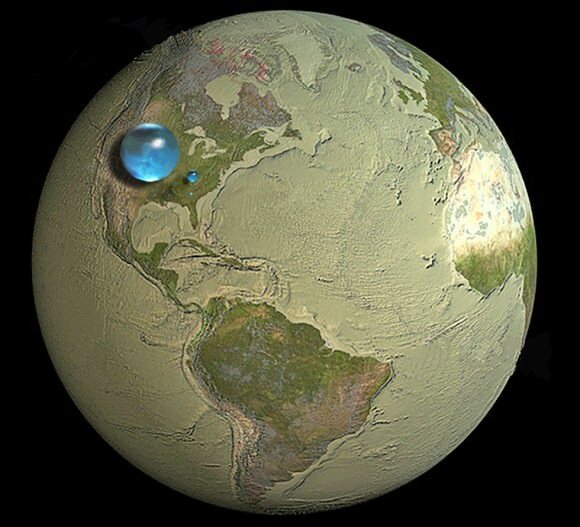 If you were to gather all the Earth’s fresh water together as a single mass (as shown in the image above) it is estimated that it would measure some 1,386 million cubic kilometers (km3) in volume. Meanwhile, the amount of water that exists as groundwater, rivers, lakes, and streams would constitute just over 10.6 million km3, which works out to a little over 0.7%. Seen in this context, the limited and precious nature of freshwater becomes truly clear. But how much of Earth is water – i.e. how much water contributes to the actual mass of the planet? This includes not just the surface of the Earth, but inside as well. In terms of volume, all of the water on Earth works out to about 1.386 billion cubic kilometers (km³) or 332.5 million cubic miles (mi³) of space. But in terms of mas, scientists calculate that the oceans on Earth weight about 1.35 x 1018 metric tonnes (1.488 x 1018 US tons), which is the equivalent of 1.35 billion trillion kg, or 2976 trillion trillion pounds. This is just 1/4400 the total mass of the Earth, which means that while the oceans cover 71% of the Earth’s surface, they only account for 0.02% of our planet’s total mass. The origin of water on the Earth’s surface, as well as the fact that it has more water than any other rocky planet in the Solar System, are two of long-standing mysteries concerning our planet. Not that long ago, it was believed that our planet formed dry some 4.6 billion years ago, with high-energy impacts creating a molten surface on the infant Earth. According to this theory, water was brought to the world’s oceans thanks to icy comets, trans-Neptunian objects or water-rich meteoroids (protoplanets) from the outer reaches of the main asteroid belt colliding with the Earth. However, more recent research conducted by the Woods Hole Oceanographic Institution (WHOI) in Woods Hole, Massachusetts, has pushed the date of these origins back further. According to this new study, the world’s oceans also date back 4.6 billion years, when all the worlds of the inner Solar System were still forming. This conclusion was reached by examining meteorites thought to have formed at different times in the history of the Solar System. Carbonaceous chondrite, the oldest meteorites that have been dated to the very earliest days of the Solar System, were found to have the same chemistry as those originating from protoplanets like Vesta. This includes a significance presence of water. These meteorites are dated to the same epoch in which water was believed to have formed on Earth – some 11 million years after the formation of the Solar System. In short, it now appears that meteorites were depositing water on Earth in its earliest days. While not ruling out the possibility that some of the water that covers 71 percent of Earth today may have arrived later, these findings suggest that there was enough already here for life to have begun earlier than thought. We’ve written many articles about the oceans for Universe Today. Here’s How Many Oceans are there in the World?, Earth Has Less Water Than You Think, Where Did Earth’s Water Come From?, Why Doesn’t Earth Have More Water?, Rethinking the Source of Earth’s Water. We’ve also recorded an episode of Astronomy Cast all about planet Earth. Listen here, Episode 51: Earth and Episode 363: Where Did Earth’s Water Come From? USGS – How much water is there on, in, and above the Earth? Earth, with its blue hue visible from space, is known for its abundant water – predominately locked in oceans – that may have come from an extraterrestrial source. New research indicates that the source of Earth’s water isn’t from ice-rich comets, but instead from water-bearing asteroids. Looking at the ratio of hydrogen to deuterium, a heavy isotope of hydrogen, in frozen water, scientists can get a pretty good idea of the distance the water formed in the solar system. Comets and asteroids farther from the Sun have a higher deuterium content than ice formed closer to the Sun. Scientists, led by the Carnegie Institution for Science’s Conel Alexander, compared water from comets and from carbonaceous chondrites. 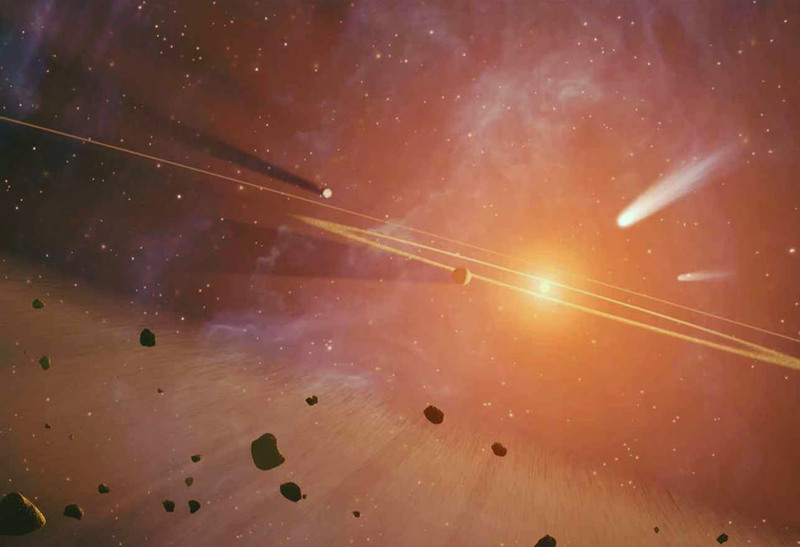 What they found challenges current models in how the solar system formed. Primeval Earth was a hot and dry place. Any water that may have formed with Earth was boiled away from the scorching crust. Ultraviolet light from the newly formed Sun stripped hydrogen atoms from the water molecules leaving no rain to fall back on the surface. Scientists believe that both comets and carbonaceous asteroids formed beyond the orbit of Jupiter, perhaps at the very fringes of the solar system, then moved inward bringing both water and organic material to Earth. If this were true, Alexander and his colleagues suggest that ice found in comets and the remnants of ice preserved in carbonaceous chondrites in the form of clays would have similar isotopic composition. After studying 85 carbonaceous chondrites, supplied by Johnson Space Center and the Meteorite Working Group, they show in a paper released today by Science Express that they likely did not form in the same regions of the solar system as comets because they have much lower deuterium content. They formed closer to the Sun, perhaps in the asteroid belt between Mars and Jupiter. And its that material that rained on early Earth to create the wet planet we know today. Image caption 2: This is a cross-section of a chondritic meteorite.